Dionisyan return with an album that builds on the virtuoso nature of their debut, yet sounds very different. Dionisyan: if you've encountered them before, you'll already be aware that they're a complicated outfit, on every level. And founder and main man, Palermo-born Sicilian Tregor Russo, as a virtuoso musician and teacher at the Regional Academy, is no less complicated himself, drawing on a wide range of classical influences and musical skills for his works, thus far realised in a 2012 EP and 2014 full-length pair of Progressive Death/Doom releases. Early announcements for the second album promised both a line-up change and a switch of genres to a mix of Atmospheric Doom and Symphonic Baroque Metal, and 'Delirium And Madness' duly surfaced towards the end of 2017 as a worldwide CD release. This time, instead of Leper Divine's Ignazio Conticelli as vocalist, Russo is joined by Federica Croce, alongside bassist Alessandro Basso, and a number of academic colleagues as guests on orchestral instruments. Immediately noticeable, with ten tracks totalling under an hour, is that 'Delirium And Madness' deals with shorter pieces: once again in concept form, narrating sorrow, loss, insanity and, perhaps, final grace. Lyrically, it's somewhat cryptic - brief, terse lines, some imperfectly translated into English, add up to more of an oblique set of emotional allegories than a straightforward tale; if nothing else, apposite for the album title. To a certain extent, you could say that, in listening terms, both nothing and everything have changed. By which I mean that there isn't too much here that didn't appear, even if only in brief glimpses, on 'The Mystery Of Faith', and the core of contrapuntal, polyphonic guitar work remains the central dynamic of this album. Yet, at the same time, 'Delirium And Madness' sounds very different to its predecessor. Croce's soaring clean vocals sound light and airy over the guitars - the opposite of how Conticelli's cavernous growls sat beneath them - bringing a much more expansive feel to the sound. That's considerably enhanced by a greater separation in the soundstage, with clear differentiation between the left and right guitar lines. And, by and large, there's a more stately pace to all of the tracks, avoiding the more frantic and up-tempo moments of 'The Mystery...'. It's a commendable evolution, in that it manages the difficult trick of presenting something different enough to sound novel, yet still appealing to those who enjoyed the debut. Of course, with anything that leans towards the classical, orchestral or atmospheric, the devil's in a number of details - fundamentally, how well that integrates into the Metal side of the equation, and whether it adds anything other than token novelty features as a result. On this, I still feel a little ambivalent. Where snatches of such instruments appear (including harp, cello, violin and flute), they seldom last more than a handful of seconds, serving as intro/outro snippets, or as a brief contrast mid-track. Even the absolutely rocking '...Toccata...' - combining harpsichord, guitar, violin and viola - only lasts just over a minute, where I was hoping it would carry on for the full Cirith Ungol-style treatment. Of course, you could argue that the vocals, whether singing or wordless, are frequently modulated in operatic or classical style, making that influence more omnipresent. Nonetheless, as on 'The Mystery...', I found myself wanting to hear more of the orchestral work, not just as interpolations, but overlapping into the body of the tracks. So, effectively, most of what you'll hear on 'Delirium And Madness' is vocals and guitar, with some comparatively discreet but effective percussion to anchor the rhythm. The contrapuntal leading melodies and voice form a triumvirate of strands that shift readily and smoothly between the complementary and the opposing. Aside from '...Toccata...', only the closing 'Guardian Angels' moves very far away from that core, as it drifts through some Goblin-styled keyboards and a gentle acoustic section sung in Norwegian by Sarah Eick (ex-Funeral). The melody lines differ from track to track but, united as they are thematically and conceptually, there's a distinct consistency of sound throughout. I wouldn't consider it a particularly easy listen, for that reason: without focus and concentration on the subtleties and complexities of the way both individual compositions and the album itself unfold, it's easy to get lost in the similarities and find it somewhat monotonous, rather than enjoying the detail. That's not intended as a criticism - merely an observation that 'Delirium And Madness' is not an album I'd want to listen to every day. It doesn't especially reward that kind of superficial experience, and returns far more when approached as an occasional but dedicated journey. Of course, that will no doubt depend on your appreciation of technicality and virtuosity - possibly, if the likes of Steve Vai or Joe Satriani feature heavily on your favourite playlists, you might well want to add Dionisyan to them straightaway. Either way, though, there's no denying that this is a polished, meticulously-executed, and highly musically intelligent construction, which builds effectively on the band's previous works. 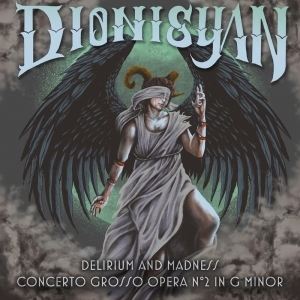 For myself, I'd still like to hear Dionisyan give more prominence to the orchestral instruments, but it's probably best if you make up your own mind on that score and on the album in general. I do recommend it, though - it's certainly not your run-of-the-mill Death/Doom derivative, and well worth your time for at least a proper listen or two.